"It's More Expensive to Do Nothing"
In her second powerful book of photojournalism, Susan Madden Lankford takes her cameras onto the streets of downtown San Diego, introducing her reader to a diverse cast of characters and a challenging set of questions that shine new light on the difficult issue of homelessness. In the early 1990s, Susan Lankford rented an old San Diego jail for commercial photography. The homeless in the area, curious about the woman and her work, frequently watched from the sidelines. Before long they began to befriend her, to trust her intentions, and to tell her about their world. The result is downTown U.S.A., the second in a trilogy of books on crucial social issues published by Humane Exposures Publishing. Lankford's penetrating photographs, rich personal narrative, and candid interviews are supplemented by contributions from the street people themselves, creating a compelling portrait of a population at risk. Insightful and empathetic, Lankford never passes judgment on her subjects. 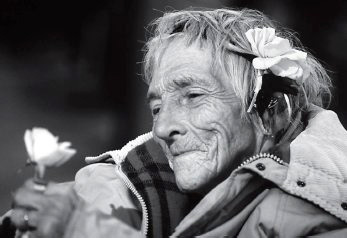 Instead, she urges her reader to take a closer look at the at causes as well as the consequences of homelessness, and to seek solutions that will create a better future for all of us. 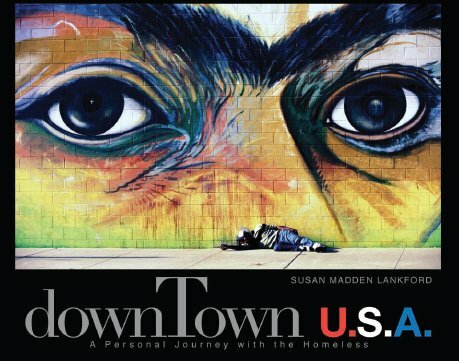 "Susan Lankford's DOWNTOWN U.S.A. is triumphant in restoring humanity to a subculture that we blithely label as the homeless." "If a single picture is worth a thousand words, then a book of carefully crafted photographs accompanied by personal accounts can convey a tremendous story. Without preaching, this photo essay is a warning that society cannot ignore its fringe elements." "An excellent book. With the click of her shutter, Susan Madden Lankford opens our eyes to an overlooked side of America. DOWNTOWN U.S.A. walks us through the door of the homeless into a better understanding of their plight."